Anyone who’s been involved in Scouting understands that Scouting teaches values. The mission of the Boy Scouts of America is to prepare young people to make ethical and moral choices over their lifetimes by instilling in them the values of the Scout Oath and Law. When these values are taught, lives are touched, examples are set, and impacts are made. 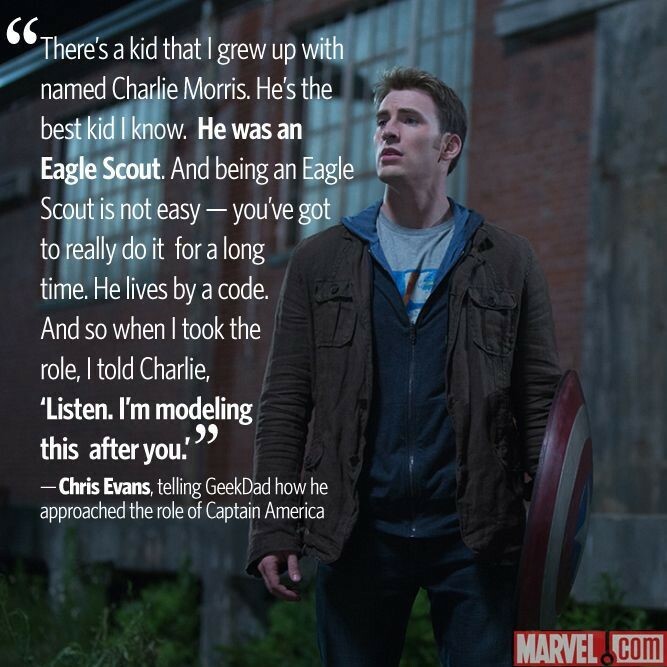 One such impact was made upon Marvel’s Captain America, actor Chris Evans, by his boyhood friend. It’s hard to find any movie superhero more popular right now than Captain America, member of The Avengers. What sets Cap especially apart from other heroes is his desire to do good, defend freedom and liberty, and help others with no thought for himself. What better inspiration for this epic movie role than an Eagle Scout? This “code” we live by, the Scout Oath and Law, sets us apart as well. The world good citizens, selfless servants, young people with moral courage and values. The world needs Scouting.